Imagine what political discourse would be like today without bumper stickers. Transfer print pottery was the “bumper sticker” of the early 19th century. The invention of transfer print pottery was squarely at the fore of a newly evolving mass culture in Europe and America. While perhaps not the most important outlet for disseminating news and ideas, transfer print pottery played a uniquely intimate role in insinuating such topics into peoples daily lives. 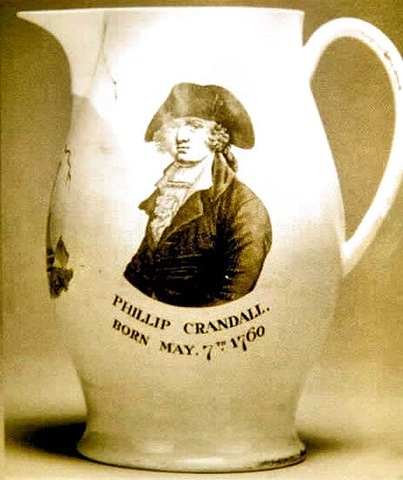 For example, thanks to the Liverpool factories that churned out transfer print pottery by the shipload, we know a little bit about Phillip Crandall, an early New England politician. 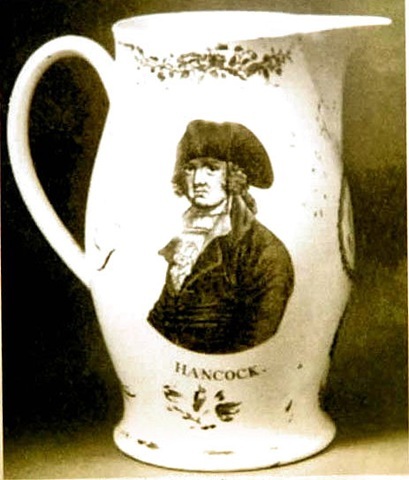 One of his more famous colleagues whose likeness was also forever enshrined on the sides of a Liverpool pitcher was John Hancock. Another was James Monroe, the 5th president of the US whose “Monroe Doctrine” boldly declared that the Western Hemisphere was now our little playground. American Patriotic and Political China. Marian Klamkin. Scribner’s and Sons/New York. 1973. This entry was posted on July 31, 2010 at 3:08 pm and is filed under Europe, North America, Pottery Decoration, Transfer Print Ceramics, Uncategorized. You can follow any responses to this entry through the RSS 2.0 feed. You can leave a response, or trackback from your own site. I never thought of these pieces as bumper-stickers…makes you think. I have always had a great admiration for the people who create this pottery. Quite a bit of transfer print pottery was commemorative in nature. Plenty was simply decorative. But there was also a fairly sizable quantity of tansfer print pottery that was “political” in nature. It is this catagory specifically that seems to me to be the forerunner of the modern bumper sticker.